The Turks have proven that they love to cook and, even more, that they love to share meals with friends. Whether at a special welcome dinner, a casual lunch, an ESL graduation, or simply while visiting people at home for business, I've been offered a wide variety of tasty foods by the families with whom I work. 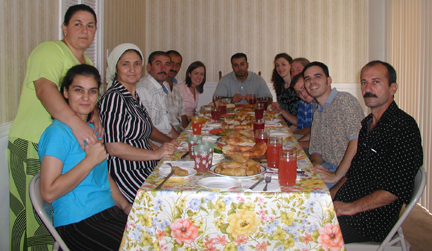 I've eaten enough meals with the Meskhetian Turk families not only to learn about some of their foods but also see what a typical meal is like: A table is set to start with bread and homemade yogurt. The first course is some kind of soup or small dish. Next is the main course---a larger meat dish. A meal is wrapped up with chai and sweets plus a course of fruit. Here are a few of the foods I have learned about in my time with the Turkish families. 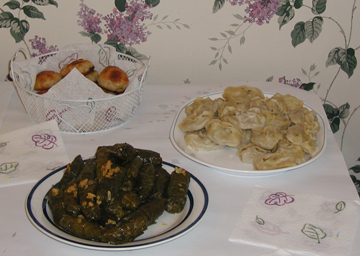 The dishes reflect the geographical history of the Turks with elements of traditional Turkish, Uzbek, and Russian foods. Ekmek (bread) - Homemade bread is a staple of Turk meals. The families make a wonderfully thick, moist round bread. Dolma - While it refers to almost any vegetable stuffed with beef, rice, and spices, the Turks tend to focus on using sour cabbage or grape leaves for their dolma. Hinkal and manti - Two types of boiled dumplings stuffed with beef, potatoes, or even sweet pumpkin. Chai (tea) - While there is not one special type or preparation, tea is a staple in the daily life of the Turks. Chorba (soup) - As with most soups, there are a number of varieties of chorba. One Uzbek type contains roast beef and lentils. Another common soup is tomato based with rice and chicken.